Van Stapele Koekmakerij is simply a treat for your taste buds. Netherland is one of the best places to have baked goods and what better than to try the delicacy in Amsterdam’s best bakery. The destination is a must visit for any traveller that comes its way due to the scintillating flavors and great taste. The cookie is one of the most famous delicacies of all and giving it a try becomes a must. Take a tram or bus from Amsterdam, Spui (Rokin). How popular is Van Stapele Koekmakerij? People normally club together De Bekeerde Suster and Amsterdam Tulip Museum while planning their visit to Van Stapele Koekmakerij. Lovely place for cookies. There was a line but it moves fast. We bought six to keep but you have to get some to eat immediately when they are still warm. They were delicious. They gave us instructions for how to store and reheat them. Definitely worth a visit if you love chocolate or cookies. One type of cookies. You just need to say how many you want. 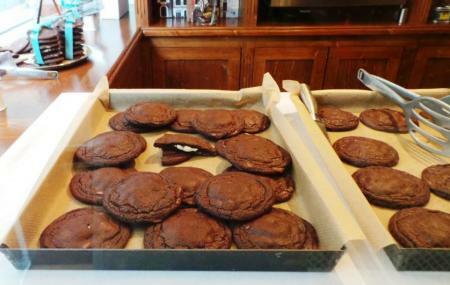 Best cookies in Amsterdam? Well they are good but then again, there are a lot of good places around. This is though one of the best and the frequent long queues in front of the shop demonstrate that. Would definitely recommend a visit. Sooooooo yummy made fresh.. The details of the shop were so cute and elegant .. The cookies are bake right in the shop in the unique looking oven.. Each chocolate cookie is stuffed with a white chocolate ball which melts in your mouth.. you can choose cute boxes for gifts or just take as souvenirs.. Staff were friendly and helpful and although they are always so busy with customers you check in and out quickly.. Awesome cookies. Whenever you go there is a queue but it is really fast. Keep in mind the store closes at 5pm. One cookie costs about 2 euros and for 6 you pay 10. The cookies are freshly baked and are very tasty. An (almost) hidden gem in the hearth of the city. They do only one type of cookie and it's amazing! Totally recommended! I've thing to note, they close when they run out of dough to make the cookies, therefore some days they close before the official closing time.